All About Fence is ready to help you with your residential fence installation service & repair in Bothell. Like most cities, Bothell has regulations for residential fencing. These are covered in the Bothell Municipal code, section 12.14.150, titled “Fences and Freestanding Walls.” The regulations are sensible and quite clear. Most of them will not apply to ordinary residential fencing. For example, electric fences and razor wire are prohibited, and fences that are over six feet tall have special rules. Barbed wire is permitted in connection with animal husbandry. The regulation that is most likely to require attention is measurement of the fence height. Specifically, “from the horizontal projection of the predominant ground level of either the city approved finish grade where such has been established or from the … predominant existing grade …” to the top level of the fence. The only time this might be an issue is if you are planning for a six-foot privacy fence. It then becomes important so that you will be able to determine if you fall under those “over six feet” special rules. We can help you with this part of the planning. More importantly, we can put in a beautiful fence that will enhance your residential property. We will make every effort to help you fulfill your goals for your residential fence. All About Fence is ready to help, just call us at (425)268-9779 for your residential fence installation service and repair in Bothell. If it has to do with fences, then we know how to do it. All About Fence is ready for your wrought iron fence installation service & repair near Lake Stevens. We have the experience, the expertise and the equipment to install your beautiful fencing in a way that flatters your landscaping – even if it involves hills. Wrought iron is a beautiful choice for a perimeter fence. It allows air flow and a view of your landscaping, yet is strong enough for some real stopping power if necessary. We can make matching gates for your fence, but we do not install automatic gates. We can, however, refer you to a company that does. Your wrought iron fence can be selected from several different designs, all beautiful. The uprights are usually set in concrete, with the dome of the concrete sloping away from the post. This helps to discourage moisture puddling with can cause rust. Wrought iron can be painted or treated to help it withstand the elements, and it is generally an excellent choice for a sturdy fence that will require little maintenance, while lend an air of gracious beauty to your property. It is an excellent companion for neatly trimmed hedges, flower beds, and paved walks. If you are looking for a fence that will add an air of elegance to your property, wrought iron is certainly an excellent choice. 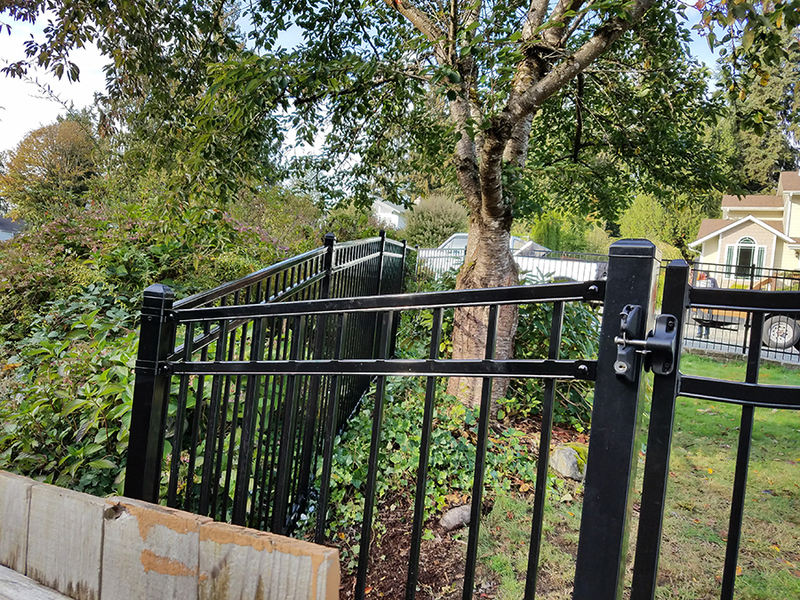 All About Fence is ready for your wrought iron fence installation service & repair near Lake Stevens, call us at (425)268-9779 to set up an appointment to discuss your beautiful fence installation. By stair-stepping the panels, we can handle almost any terrain including steep hills. We will be more than glad to discuss pattern, location and time for installing your wrought iron fence. All About Fence has your wood fences and wooden privacy fence installation near Snohomish. There really is nothing quite like the beauty of wood. It can be set up as a picket fence, or as an upright board privacy fence. Both cedar and redwood make beautiful wood fences, and present home and business owners with options for their finish. They can be left as natural wood. As such, they will weather to a beautiful gray patina. At that point, you can add a preserving finish to help maintain your fence or simply rely on the wood’s natural weather resistance. Or you can preserve the new wood finish with a clear preservative finish that will let the natural contrast of heartwood and pulpwood shine through for many years. A privacy fence has many obvious purposes. One is to allow you, your family and guests to enjoy your backyard or patio without sharing with your neighbors. Another could be to hide unsightly installations, such as a trash disposal unit or a collection of old cars. But one purpose that is not discussed a lot is to serve as a background for beautiful, tall flowers and ornamentals. Hollyhocks and Delphiniums both make a brave showing against a privacy fence. Pampas grass, evergreens, and elephant ears are three more ornamental plantings that come to mind. The fence provides a backdrop that almost acts as a canvas for a natural painting of plants. All About Fence has your wood fences and wooden privacy fence installation near Snohomish, just call us at (425)268-9779 to learn more. Summer is a fantastic time to install a new fence before you start in on landscaping details. Working around existing landscaping features can be a challenge, but we will do our best. All About Fence can help with your chain link fencing installation service & repair near Marysville. We have the skills and the tools to install and do all of the maintenance on your chain link fence. We also make gates, although we do not install or take care of automatic gate openers. However, we can recommend some good companies that do that sort of work if you wish to have an automatic opener. Chain link attached to steel posts that have been sunk in concrete makes an excellent, serviceable fence. As a barrier, it has good stopping power. Add colorful slats and you can turn it into a privacy fence that can display art work or your company’s logo. Unfortunately, some people see a fence as a challenge. According to the CDC, there are about 10 unintentional drownings per day. For every death, there are another five who will receive emergency rescue treatment. About half of these are children under the age of five years old. As a result, in most areas, swimming pools are required to be fenced and to have added security. Yet, in spite of all that, you see sights such as five young men climbing over a pool fence because they wanted to go night swimming and the pool gate was locked. Quite aside from the risk to the young men, such activities are hard on fences, slowly causing them to break down and require maintenance. 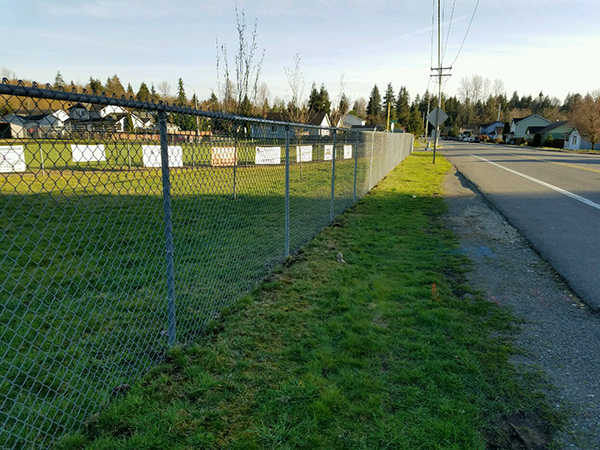 All About Fence is prepared to help you with your chain link fencing installation service & repair near Marysville, just call us at (425)268-9779 to learn how we can help. Your chain link fence shows your concern for restraining traffic and your desire to set boundaries. We can help with that. All About Fence can be all about your security fence installation service & repair in Lake Stevens. Of course, no fence or wall is the complete answer to security for your home or business. However, an sturdy fence provides a firm statement about where your barriers are located, and where people or animals should be allowed. Security fences are often part of a business’s perimeter, sending the “Not in Here” signal to unauthorized personnel, and creating a specific area for security alarm systems or patrols to supervise. They do more than that, however. For example, if your business is providing used car parts to owners of older automobiles, your security fence also acts as an aesthetic blind, keeping the sight of tired, worn vehicles from the general public view. Security fences can also help establish areas where casual visitors might create a danger to themselves or to others. Even in the early days of industrialism, it was a good idea to keep uninformed thumbs out of the works. A fence is never the complete answer. Humans are ingenious when it comes to discovering ways to flout good sense and authority, but it does create a place to start. 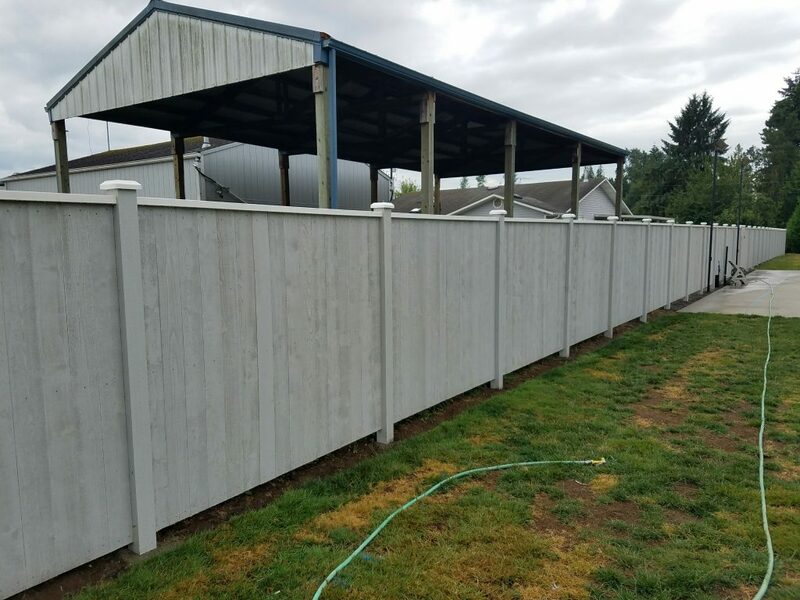 All About Fence can be all about your security fence installation service & repair in Lake Stevens, call us at (425)268-9779 if you are ready to place a firm demarcation around your business property’s operations. We understand that a sturdy fence is a good place to start when you are setting up a security system, and we are glad to help. Chain link or tall privacy fences are often a good choice. They present an obvious message that should not be misunderstood by passersby. All About Fence can handle your vinyl fence installation & repair near Everett. Vinyl fencing can be a viable, low-maintenance option for your fencing needs. Vinyl has the advantage that it does not require painting, is not susceptible to water damage, and can maintain its appearance for several seasons. Vinyl fencing is low maintenance, and some types are made from recycled materials. The downside is that vinyl fencing can be an expensive initial install. Over time, this is offset by not needing to paint your fence because it will not biodegrade or rust. Some colors and types of plastic will fade over time, but in some locations, this might not be a problem. Repairs to a vinyl fence can be a little trickier than for a wood or metal fence, but we are more than happy to help you take of your repairs – but with a good vinyl fence, we are betting that you won’t need us very often. Not only does vinyl fencing retain its appearance with little or no maintenance, it has greater flexibility than wood or metal fence panels and is more likely to bend than break, yet it can still be strong and sturdy. This can be an advantage in some climates. Call All About Fence at (425)268-9779 to learn more about vinyl fence installation & repair near Everett. We will be glad to discuss your options and to send a representative to help with measurements and other considerations, such as whether step panels will be needed for a hillside or accommodation for a waterway. Since no two locations are exactly the same, each installation can require special considerations. Putting in the fence that you want and making it work for you is our primary goal. All About Fence would be proud to install for you a beautiful cedar wood fence in Marysville. Cedar is one of those beautiful woods that are perfect for a variety of projects – from polished, red and blond-streaked linen chests to rugged, weathered gray privacy fences. Cedar is an ideal wood for outdoor use. It is naturally resistant to depredation by bugs and even resists weathering. If you walk through a cedar glade and see an old, uprooted tree, you will note that even if the bark has weathered away, the wood remains sound. Some parts of it will weather into sharp points reminiscent of a deer’s antlers. This natural resistance means that cedar makes good fencing. Its natural weather resistance can be enhanced with a paint, or with a clear, protective coat that will help preserve the fresh coloring of newly cut cedar wood. On the other hand, if you like the soft, gray patina of weathered cedar, let it go for a season or two, then coat it with a clear finish to set the coloring and to help preserve it. Cedar makes good planks for privacy fencing, but it also makes good pickets for a traditional picket fence. As natural materials go, it is nearly perfect for outdoor use – and has its moments for use inside your home, as well. 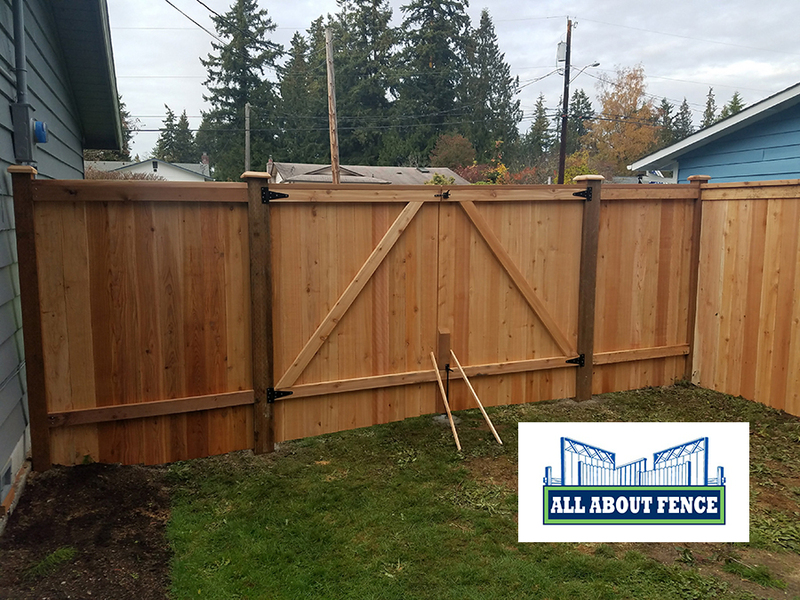 All About Fence would be proud to install for you a cedar wood fence in Marysville, just give us a call at (425)268-9779 to learn more about this incredibly versatile building material. We will be happy to show you our cedar fence models and to discuss where, when and how you want your cedar wood fence to be built. As you are trying on that swimsuit to see if it still fits and cleaning out the pool, don’t forget to prepare for pool safety with a pool fence in Bothell. All about Fence has the fencing and gates that will help you meet state standards. We don’t install gates (although we do make them) or put in alarm systems, but we can put you in touch with an excellent company that does that type of work. Pool fences are state mandated. While there might be some variance between regions the general requirements for are essentially the same because they focus on the abilities of children to access an unattended pool. Kids are curious, and most of them love water. It only takes a few seconds for a youngster to slip away and to quickly be in trouble. A good pool fence is an excellent preventative. A pool fence should be at least 60” tall and have an automatic latching gate on which the opener is too high up for most preschool children to reach. By adding an alarm mechanism that will create an alert on your home security system you can increase safety for school-age children and teenage youth, who also are curious and too frequently have little regard for boundaries. Your house can be one side of your pool fence, but if it can be accessed from the house, the door must be secure and have an alarm that sounds throughout the house, and that is distinctly different from all other household alarms. Chain link, privacy or pickets with narrow spaces are suitable for pool fences. 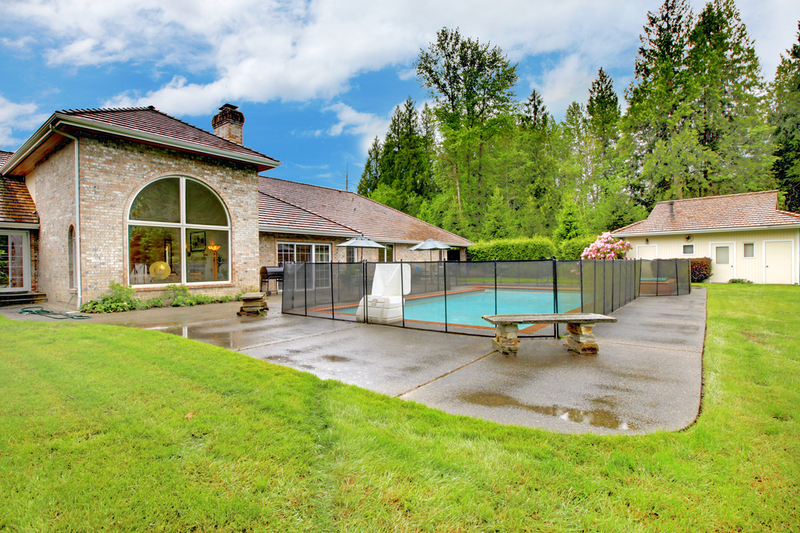 All About Fence is ready to help with your pool fence in Bothell, just call us at (425) 268-9779 to learn more about state-mandated pool fence requirements. We are always glad to help. 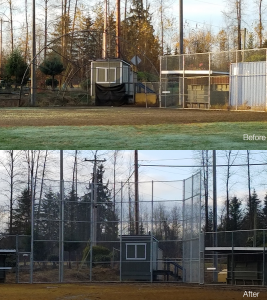 All About Fence has the expert fencing team for your industrial fence installation service & repair in Snohomish. With years of experience behind them, our team can handle just about any kind of fence you want to install, but our specialties are chain link, cedar wood, and ornamental iron. When people think about industrial fencing, they often picture tall installations of chain link fence. In many cases, they would not be wrong. Chain link is economical, sturdy and can be teamed with automatic gates. We don’t install automatic gates, but we can build them and put you in touch with an excellent company that does that sort of work. However, industrial fencing does might not be just chain link. It could be cedar privacy fencing or ornamental iron, depending on the location of the fence and the needs of the company. Sometimes appearances are as important as stopping power when it comes to an industrial fence. An attractive fence adds to your property value. 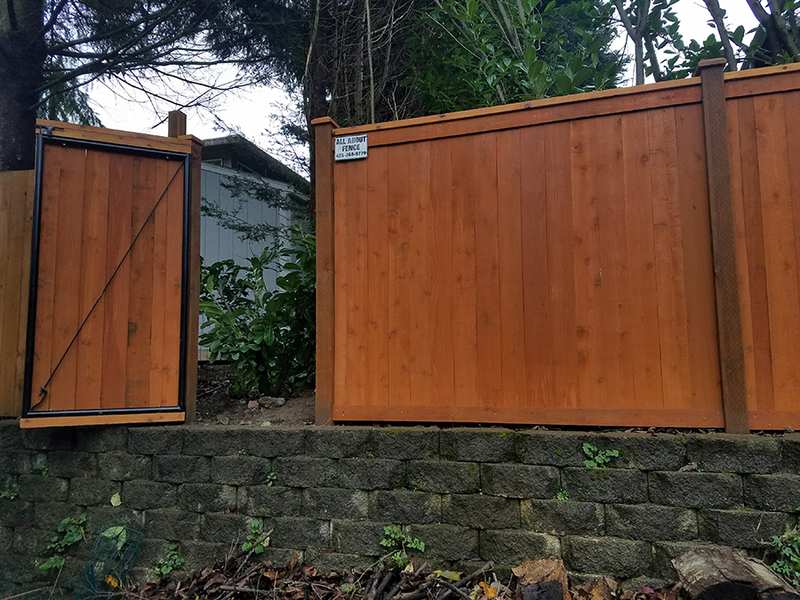 We are especially proud of our cedar wood fences, which can provide a definitive demarcation for property lines or can be used to hide unsightly utility areas, such as trash dumpsters. 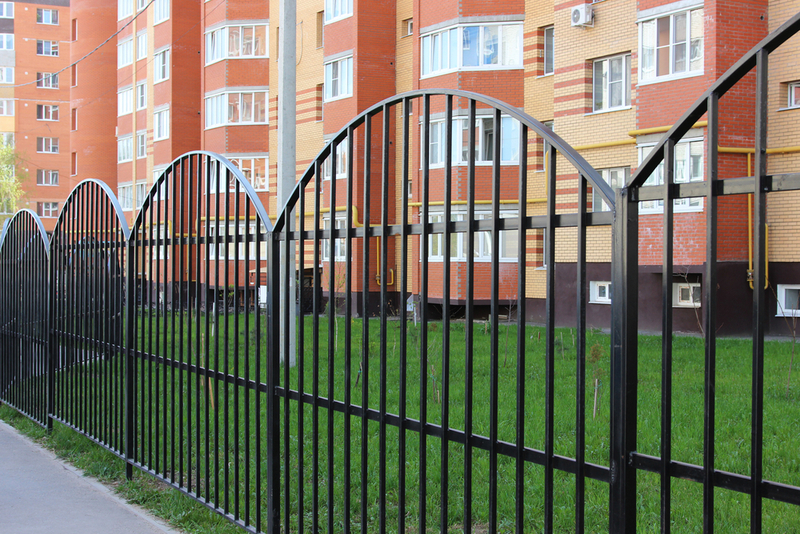 Ornamental iron can be a superb choice for gated communities or for an office complex. Even chain link can be made attractive by adding plastic privacy strips, which can be used to create your logo or even a mural. 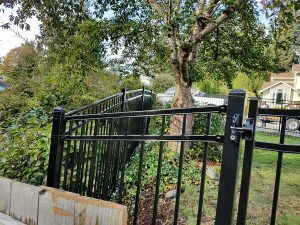 Phone All About Fence at (425)268-9779 today for your free estimate on industrial fence installation service & repair in Snohomish. Our estimators are not sales people. They will give you a fair and honest estimate for the type of fencing you want in the location where you want it placed. Our goal is for you to have the fence you want that provides both function and beauty for your workplace.